Wishing you a peaceful and happy holiday season! It's probably worth mentioning that accepting a book from an author is a no-no according to my own review policy but I'd forgotten that until the author reminded me by mentioning that she found my review policy entertaining (I had to go back and see what I'd written, it's been so long since I updated it). Well . . . one exception due to forgetfulness is okay. The replacement book that I mentioned above is one I've already reviewed: Death of a Snakecatcher. When I wrote about the binding problem that was causing pages to fall out out of Glagoslav books, my contact took it very seriously and got in touch with the printer. After the binding issue had been fixed, she offered replacements of the books I've been sent in 2018 and I only accepted the one because I'd like to keep that particular title for rereading. The Haymarket Books I bought on sale. I've been interested in Haymarket titles for a while but hadn't taken the plunge. At 50% off, though, I decided the time had come. Splinterlands is the only fiction title of the four I bought. 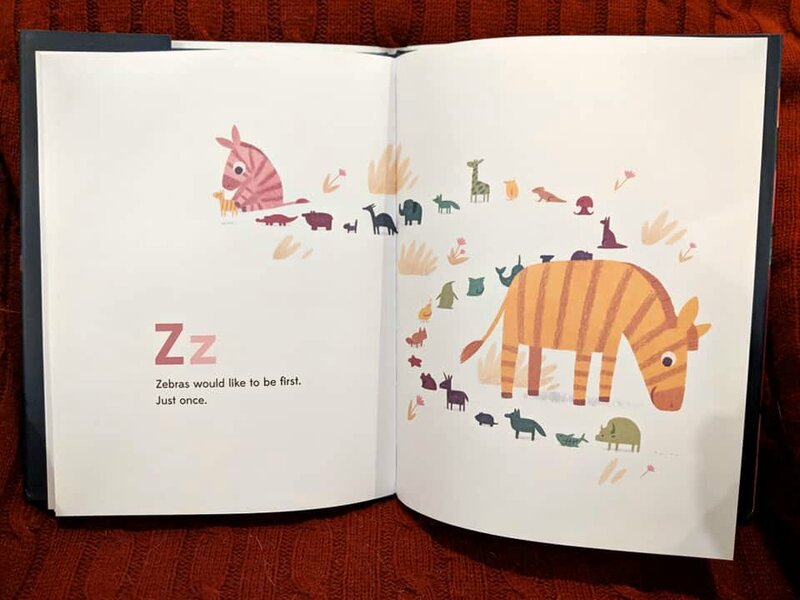 The latter of the two is a children's book that my youngest son bought for our eldest granddaughter and will be sending her for Christmas (I think -- he actually got her two books, so I'm not sure which one he'll send). I couldn't resist reading it before it goes out the door. Friday Black is a knock-your-socks-off collection. I'm so impressed. I just started The Huntress, last night, and I didn't get very far so I considered not mentioning it but I enjoyed what little I read and think it's likely that it'll take, so to speak. I hope so. It might be responsible for the "chased by an assassin who is slowly killing off all your fellow spies" dream I had. That was an interesting dream. We've been spending most of our free time tidying, wrapping, decorating (with the goal of going slowly overboard like they do in Hallmark movies) but we've had a little time to sit down and watch TV. We enjoyed the finale of Dr. Who, watched Sahara for the umpteenth time, and I caught a couple Hallmark movies. I liked one of them so much that I watched it twice: A Christmas Detour. I've found that I like all of the movies that star Candace Cameron Bure but this is the first one I've liked enough to watch it all over again. I think I'm all done with Christmas shopping but I need to do a mental checklist, one last time, to make sure. At the very least, I got the one bit of shipping I needed to do out of the way, so that's exciting. In recent years, we've usually been so late to ship things that sometimes they haven't arrived until after Christmas. Getting that out the door in plenty of time was a very good feeling. 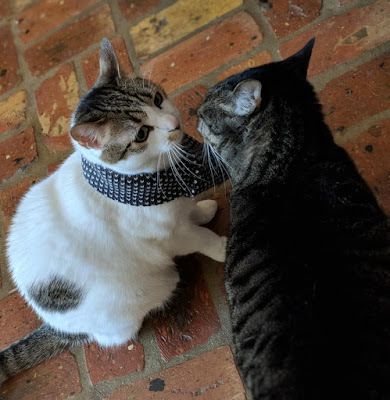 When Mom puts a scarf on your sister and you show your concern by sniffing her like she's some kind of alien that just landed. 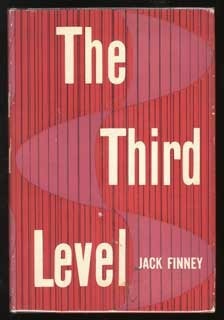 The Third Level by Jack Finney is a book of short stories that I would classify as sci-fi. He tends to lean toward the fantastic, with emphasis on time travel, although this book is not exclusively dedicated to time travel as some of his other books are. Jack Finney is one of my all-time favorite authors, best known for Time and Again (link leads to my 2014 review of Time and Again) and The Body Snatchers, which has been made into the many Invasion of the Body Snatchers movies. I'm constantly searching for more of his work. He died decades ago and it's difficult to locate his books. I found a used copy of The Third Level in very good condition and bought it earlier this year, then saved it for a time when I was in the mood for short stories and something reliably entertaining. And, it was definitely that. There has never been a time that I sat down to read Jack Finney and came away disappointed. "The Third Level" - In the title story, Charley gets lost in New York's Grand Central Station. After stumbling through lengthy corridors, trying to find the second level to catch his train, he arrives in a mysterious third level where everyone is dressed in historical clothing, preparing to ride an old-fashioned train. He has wandered into June 11, 1894. The narrator confirms this by peering at the date on a newspaper -- one that is no longer in print. At first, Charley's discombobulated but then he realizes that he would love to see his hometown in 1894. He's heard stories about what an idyllic place it was. He attempts to buy two tickets to Galesburg, Illinois. He'll bring his wife, Louisa, and they'll be able to see Galesburg twenty years before WWI. But, there's a problem. Charley's cash is from the future. Before he can be turned over to the police for attempting to buy tickets with the strange money, Charley rushes away, back through the twisted corridors, and finds himself back in his own time. But, he's determined to find the third level, again. He tells only one person, who is skeptical. And, then one day he finds a letter in his grandfather's collection, dated 1894 in Galesburg, Illinois. "Such Interesting Neighbors" - Al and Nell have new next-door neighbors and there's something odd about the Hellenbeks. Everything they own is new but their stories about why they have only new clothing don't match up. Ted is excited about a particular book that he bought for only $3 but which could be work thousands, 140 years from now. Ann walks straight into a wooden door and Ted reminds her that doors don't open themselves and she'll have to get used to it. Are the Hellenbeks from a future world? "Cousin Len's Wonderful Adjective Cellar" - 'Cellar', in this case, is a receptacle and the adjective cellar is at first thought to be a salt cellar. Cousin Len's cellar adds adjectives to the writings of anyone nearby. An extremely clever and amusing story that turns out to be a valuable writing lesson, as well. Another favorite story, "Second Chance", tells about people from another world, where everything is sunlight and flowers, happiness and health. The hero of the story is told where he can go to acquire a ticket to this world, but he'll only have a single chance and if he blows it that chance is gone forever. Highly recommended - Although it's not the easiest book to find, if you like short stories that are glimpses of other worlds or hint at the paranormal, you should try to get your mitts on a copy of The Third Level. It's thought-provoking and wondrous, and the fact that Finney died decades ago means the present world as he describes it is itself a world of our past. I always feel transported to another world even in the most common of Jack Finney's stories. And, all are written with skill. "Cousin Len's Wonderful Adjective Cellar" is a fine example of what a pro Finney was. When Nicholas Lyon's father rejected him, he did so in an extraordinarily painful way. Now, years later, Nick is the owner of a successful gambling establishment and happy to strip the wealthy of their holdings when they lose at his tables. But, then disaster strikes. His brother is killed in an accident and Nick inherits his family's ducal holdings. Nick has never planned to return to his childhood home; it only holds terrible memories for him. But, as the Duke of Tremayne, Nick is responsible for his family's estate, Enderley Castle, the home he and his mother escaped many years ago. When Nick arrives at Enderley, he intends to only remain at the castle long enough to sell off many of the valuables in preparation for leasing it out while he returns to his London home. He's not expecting to find that the steward of the estate is a trouser-wearing woman with a similar need for order. As he gets to know his steward, Mina Thorne, Nick is surprised to find himself dragging his feet and even enjoying his ability to improve the lives of his tenants. But, Nick was traumatized by his father's abuse. Will he be able to overcome the pain of his past? Recommended to a specific audience - I read A Duke Changes Everything for the change of pace (thanks to a slumpy couple of months) and I was not disappointed. I thought it was surprising how quickly the duke softened, but the author managed to characterize him as a man with a softening heart and yet still retain the challenge of dealing with his childhood trauma while he was slowly falling in love with his steward. And, there were plenty of little surprises. There was one scene in particular that I felt was more authentic to what I'd expect of the time period than what you often find in historical romance. There were a couple historical anachronisms, but that scene helped to balance things out a bit and, anyway, I just enjoyed the reading. Mina is a likable character and the way Nick's heart is softened by doing good makes sense to me. And, the ending is incredibly satisfying. My thanks to Avon Books for this unexpected gift. The next in the series is going to be the story of one of Nick's gambling business partners and I found him very appealing so I hope to read the next in the series, as well. Just one arrival but it looks like a good one. 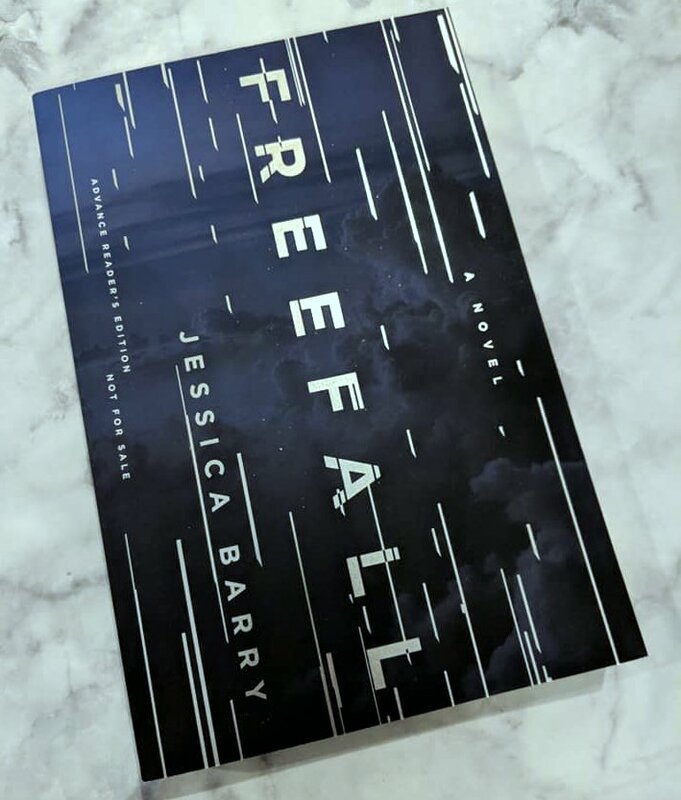 I may read it next, just because I'm still reading so slowly and Freefall is described as fast-paced. I thought a romance would do exactly what I'm hoping Freefall will. No luck. I'm enjoying my reads but just not reading at my normal pace. It's frustrating but I'm trying to just roll with it. I did enjoy the romance break and am looking forward to a second one as I have a Vivienne Lorret book on the stacks, Ten Kisses to Scandal, and I love her romance novels. After watching the movie, Their Finest, I decided I needed to get around to reading the book and, sure enough, it's even better than the movie, although I enjoy reading about Catrin (who is writing "slop" or women's dialogue, for propaganda films during WWII) more than I enjoy reading about Ambrose Hilliard, the aging actor who is frustrated by his shrinking roles. I think the American printing is entitled Their Finest rather than Their Finest Hour and a Half to match the movie, but I'm not 100% certain about that. My copy is an older, secondhand book. 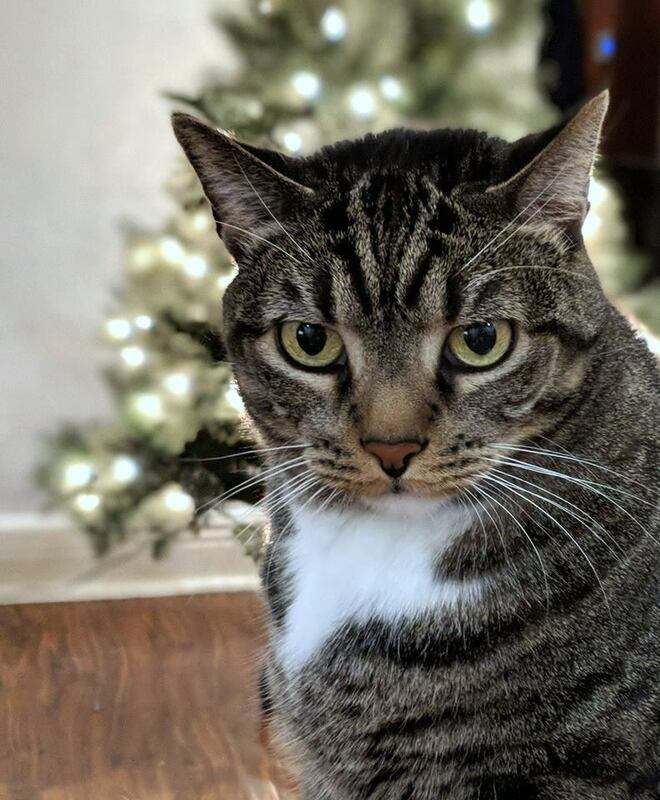 Our Christmas tree has been up since Thanksgiving but it remained undecorated until this weekend, when our future daughter-in-law came over to hang out with Kiddo. 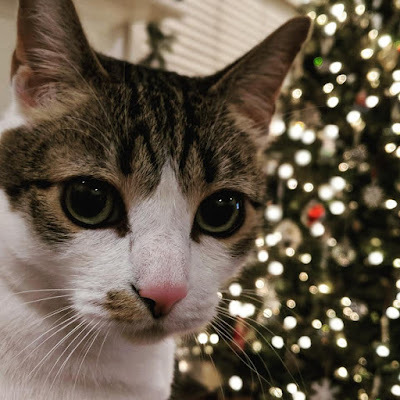 Husband turned on Christmas music, Kiddo pulled out the ornaments, and DIL got to work on the tree. And, then she made brownies! I think we'll keep her. We went to a high school choir festival called Singe Feste (they hilariously went way overboard adding e's to the words in their program). It was a Medieval play along with singing of course, a meal, and wassail for toasting. We were served by choir members dressed as serfs. We didn't watch anything notable on TV. More Hallmark movies, a couple older films (including War Games, which is still relevant 30 years after it was released), the Dr. Who finale. On Wednesday, I watched part of George H.W. Bush's funeral but not all of it. I came in a little late. Most of what I watched this week was already on and I just returned to the beginning of the movies currently playing. I do love that about streaming, the ability to return to the beginning of a movie that's already playing. Once again, waiting for a drink. 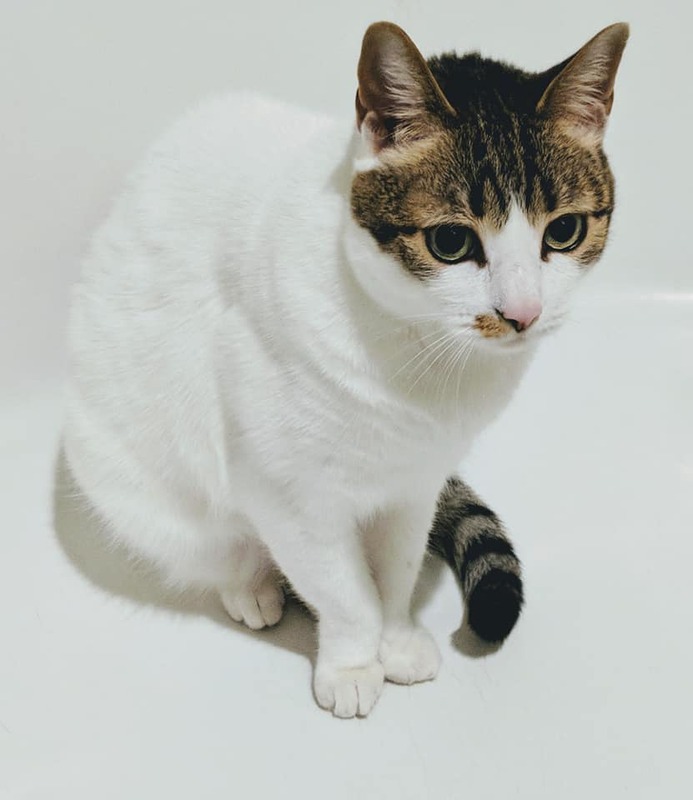 Bathtubs make excellent portrait backgrounds! Alligators think you'd like them if you got to know them. Bears sometimes want their mothers to kiss it better. Chipmunks love to stay up past bedtime. Zebras would like to be first. Just once. Ha! I love it. I wish I could run this one by my eldest granddaughter (I have two, now!) because I'm sure she'd get a kick out of it and I'd love to watch her face light up. 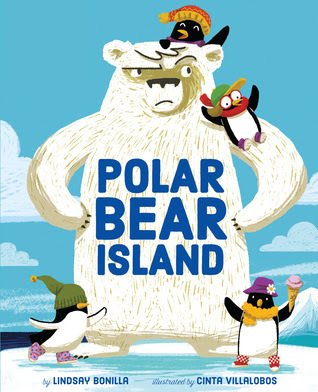 Recommended - A cute, funny, unique, delightful ABC book with charming, often humorous illustrations. I'm a big fan of the mildly muted but colorful palette on a white background. That must be an aesthetic I'm drawn to because I recall gushing over a few other books with the illustrations on plain white backgrounds. Some have a scene that includes sky and foreground but which is then given a cut-and-paste look on white. If I didn't happen to be a purist I'd say this is a great book from which to cut out pages for framing (but that would drive me nuts -- I like my books bound, not in pieces). 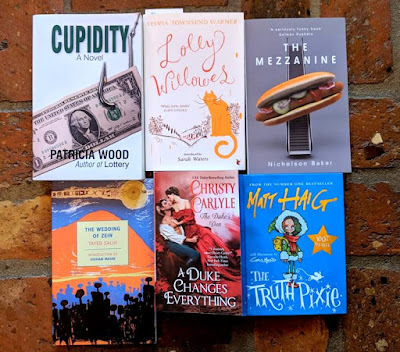 I first wrote this review of Lottery by Patricia Wood in November of 2007 and didn't realize I had never republished it on my blog (it was originally published at The Estella Collective) until I wrote my review of Cupidity, also by Patricia Wood, and couldn't find the review to link up to. So, this is an older review, republished to get it onto my blog. It's worth reprinting because the book is phenomenal; it was short-listed for the Orange Prize and I've been craving a reread, thanks to Cupidity. See also, my review of Cupidity by Patricia Wood. The man chews his cigar, looks at his watch, squeezes his fender, and talks to Gary, all at the same time. “I need to get to the San Juans . . . Friday Harbor . . . Three weeks vacation . . . Can we speed this up?” he asks. “I need to get going.” He looks at his watch, again. Vacations are when you stop being in a hurry to go to work and start being in a hurry to go someplace else. Lottery is the story of Perry L. Crandall, a caring and sensitive man with an IQ of 76. The L in his name, his Gram tells him, stands for “Lucky”. When Perry proves his luck by winning the Washington State Lottery, suddenly his life changes dramatically. People who were unwilling to look him in the eye now boldly ask him for money, the family members who ignored him suddenly become concerned about his well-being and clerks treat him with obsequiousness during shopping trips. But, will Perry be able to handle his windfall or is the fact that he’s slower than average likely to become his undoing? Because Lottery is written from Perry’s point of view, there’s a simplicity and power to the story. The reader knows how Perry thinks and what’s important to him, feels the pain of condescension and insult, becomes angry at the way people speak within his hearing, assuming that he’s unable to translate their plots to take advantage of him. There’s an immediacy to the story, a feeling that one must keep rapidly turning the pages because Perry is such a delightful character that the reader absolutely must know what’s going to occur. In fact, Perry has difficulty remembering and understanding certain concepts, but throughout the reading of Lottery the reader gains an understanding of how meaningless an intelligence quotient really is. Perry has his own brand of wisdom and is intelligent in many ways. His translations of the implication within spoken words reflects an ability to observe and reason. Because he reads from a dictionary and takes notes, each day, Perry develops a deeper comprehension of words and their varying definitions than most of the people around him. When the story opens, Perry has been working at Holsted’s Marine Supply in Everett, Washington for many years. His late grandfather taught him to sail and Perry knows boats and their requirements better than the other employees and often even his boss; his Gram spouts bits of wisdom and bolsters his self-confidence. When she thinks he’s out of line, she says, “Don’t be smart.” Friends Keith and Gary -- Perry’s fellow employee and employer -- along with his Gram, treat him with the respect that nobody else offers him. By the time Perry wins the lottery, the reader is intimately acquainted with Perry, enough to know which of his acquaintances are true friends and who will steal from him if given the chance. What the reader doesn’t know is how Perry will handle the threats and opportunities around him. Even while I was madly turning pages as I read this novel -- a book that I could barely stand to put down the night I began reading and snatched up the moment I had time to read, the next day -- I feared that the predictable course would unfold. Perry is a warm, generous and kind-hearted character that you can’t help but root for and fall in love with. It’s only natural to want the best to happen and to fear the fate that seems inevitable when his family swoops in and attempts to fleece him. In the author’s introductory note, she describes the background of Lottery and her “need to write a compelling story that people will listen to, remember, and learn from.” Did she succeed? Absolutely. Perry L. Crandall is a character I plan to revisit, both for his and his Gram’s unique brand of wisdom. Is the novel compelling? Definitely. Did I learn from the story? No doubt about it. Author Patricia Wood succeeded on all levels and I hope that she’ll publish a second novel very soon. 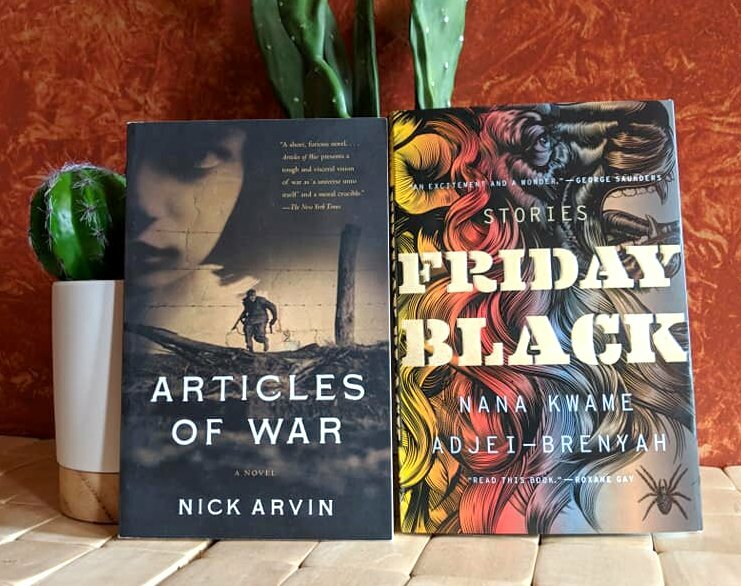 The two WWII books were bought on a whim because The National WWII Museum had a sale for Black Friday. I have no excuse other than my love of reading anything and everything about WWII. Yep, just one book going, at the moment. I wouldn't say I'm in a reading slump, but I'm reading awfully slowly and not as many pages per day as I normally do. My new addiction to The Hallmark Channel may be partially to blame. I keep staying up later than normal, watching gushy romantic movies. I love them. While I'm still watching a gazillion Hallmark movies, Husband is "all Hallmarked out," so I've lost my movie buddy. Bummer. Honestly, I'm surprised I've lasted as long as I have. My tolerance for cheesy movies is normally pretty low and the duplication of the same elements is . . . just, wow. There's always a dead parent. Always. If someone lies, the other person is going to say, "The only thing I can't stand is dishonesty" (future Black Moment, you have just shown your hand). And, if there's already a boyfriend or girlfriend in the picture, he or she will be so clearly wrong for our hero or heroine that we are almost obliged to shout, "He's not right for you!" from the sofa. Seriously, they are so much fun to watch, those Hallmark movies. So far, my all-time favorite is The Nine Lives of Christmas because cats. Of course. The Schwarz family (because the house is from F. A. O. Schwarz) went to Grandma and Grandpa's for Thanksgiving. They took their trailer because Grandma and Grandpa only have one spare room. The kids stayed in the trailer, of course, since it feels more like an adventure. 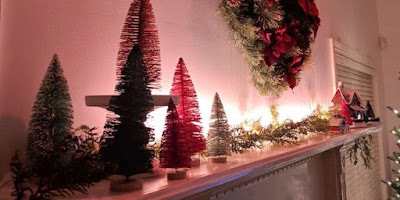 On the way home, the Schwarzes stopped at the tree farm (at left) and the display on the mantel shows them about to arrive home (on the right). Because what's the point of decorating if it's not entertaining, right? The pinkish tinge is caused by some funky lightbulbs Huzzybuns bought. He's having fun entertaining himself, too. I hope to get a happier-looking expression, some time this season. In a small town in the state of Washington, Tammy Louise Tyree is working herself to a frazzle. She provides for her erratic Uncle E. and her (maybe autistic) younger brother by working 4 jobs. She has to fend off her no-good cousin and annoying boss, balance her jobs, try to keep her uniform clean and arrive at work on time, and keep everyone fed. For Tammy and her family, there's no way but up. When she receives an email saying her missionary relatives in Africa have left her $5 million, she's ecstatic. But, there are conditions. She has to keep the news about the money to herself and turn over all sorts of information and fees. As she works feverishly to pay the fees that her new African friend is charging her and fill out the forms, the news slowly gets out that Tammy is about to receive a fortune. And, everyone wants in on it. Only one person thinks Tammy is being scammed and Tammy's sure not going to listen to him. When Tammy suddenly has people all over the tiny hick town insisting on helping her out in the hopes that they can get in on the windfall, what will happen? Highly recommended - I don't want to give away too much about Cupidity because it's far too fun experiencing the unfolding events but I found it absorbing, nervewracking, and funny. You can't help but admire Tammy Louise. At one point in the story, she asks someone what other jobs she holds and is shocked when the woman replies "This is my only job." Tammy is so accustomed to working 4 jobs that she has no idea it's actually possible to survive on a single income stream. She is the hardest-working, most likable character that you've ever worried about throughout a novel. I love her. 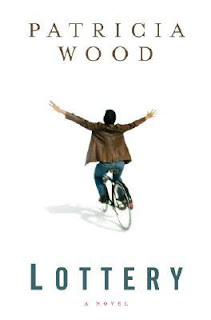 Just as I still have not forgotten the names of the characters in Patricia Wood's first book, Lottery (that's extremelly unusual -- I never remember characters' names unless they're common knowledge like Elizabeth Bennett and Mr. Darcy), I doubt I'll forget Tammy, Uncle E., and Jar, anytime soon. 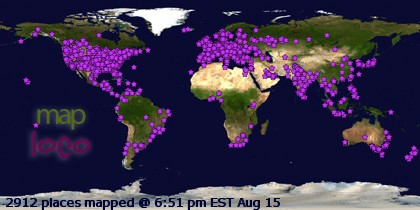 As you can see from the image, I gobbled down Marilla of Green Gables by Sarah McCoy while I was in Hawaii. I'd already read a little bit of it before I left home and I spent a blissful day reading outside to finish it up. 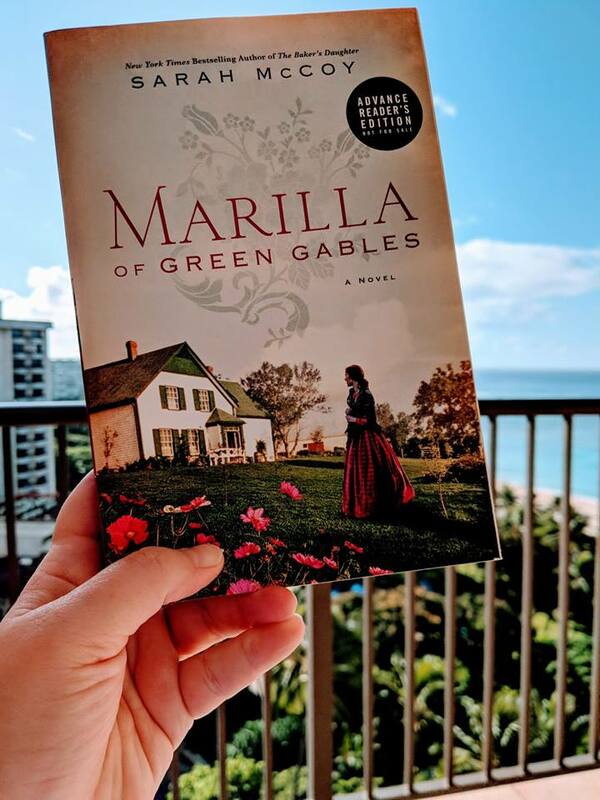 Marilla of Green Gables is the story of Marilla's early years, before Green Gables acquired its name. At 13, Marilla's responsible for helping her mother with chores while her mom goes through pregnancy. When tragedy strikes, her mother's twin arrives to help out. During this time, Marilla makes a new friend and falls in love. All of this is set against the backdrop of political upheaval and rebellion on Prince Edward Island. I just finally read Anne of Green Gables in 2008 (link, through the title, leads to my 2008 review) and I have never managed to read on. In fact, I don't remember it all that well, apart from Anne's bubbly personality. Not remembering much about the original book was not a problem. I remembered that Marilla was a single woman with a brother she was close to and I remember the face of the woman cast as Marilla in the series I watched many years ago. I presumed that the author's intent was to explain what happened that led to Marilla being a spinster. 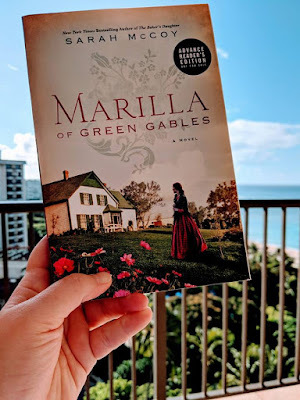 From a friend's review (a friend who was a big fan of the books and series), I also know that Marilla of Green Gables introduces us to a friend of Marilla's who appears in Anne's story. I did assume she probably appeared in Anne of Green Gables, but I'm not familiar enough with the story to have known that, for sure; it was just a guess that turned out to be right. Marilla's love interest in Marilla of Green Gables is based on a single quote from Anne of Green Gables. This is mentioned in the author's notes. 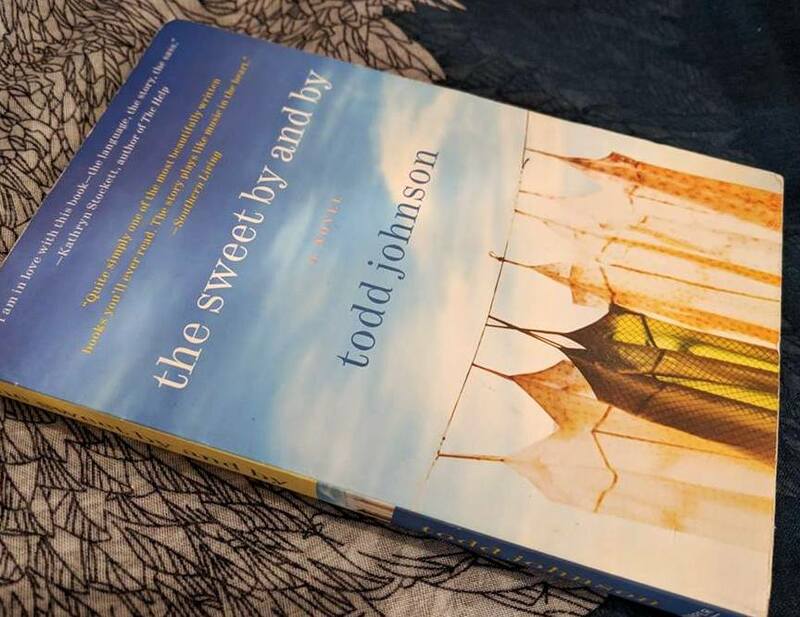 Highly recommended - I can't speak from the perspective of a fan of Anne of Green Gables, since I've only read it once and (while I did love it) don't know the characters all that well. But, I found Marilla of Green Gables immensely absorbing and believable. The political situation is something I was totally unfamiliar with and I confess I found it a little hard to follow but I did think it was necessary to the storyline. I thought the author did an excellent job of staying true to what little I recall of the character and that it was convincing and entertaining. This is my first read by Sarah McCoy and it definitely won't be my last. Only one book finished but Cupidity was a good one (5 stars for totally sweeping me away). I made the irrational assumption that "cupidity" was a coined word because one of the main characters makes little cupid whirligigs and there's a tremendous amount of stupidity going around in the story, although eventually people start trying to talk some sense into Tammy Louise when she keeps sending money to a man who claims she's inherited $5 million and needs to keep sending fees for this, that, and the other thing. But, "cupidity" is an actual word that means greed. New vocabulary word! Woot! There's a bit of a Deus ex machina ending but . . . personal opinion? Sometimes that's okay. It makes the ending surprising, although similar to what I guessed was going to happen (there's a bit of late foreshadowing, but not in a way that ruins it). 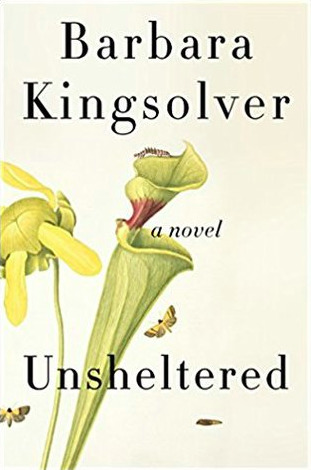 I'm enjoying Unsheltered and a little over halfway through it, now. I didn't read any of the WWII book at all, this week, so I don't feel like listing it and I'm considering starting it from the beginning, again, even though I don't need to -- just to read it from beginning to end instead of continuing it in interrupted fashion. I've frustrated myself by setting it aside for too long. I also read a single chapter of a romance: A Duke Changes Everything by Christy Carlyle. The first chapter introduces readers to Nicholas Lyon, a duke whose father suspected his wife of fooling around and apparently had little to do with him. Nick runs a gambling den and is described as a cruel, heartless jerk. I suppose a lovely lady is going to come along and reform him. I let Thanksgiving get in the way of blog posting, last week. Although Kiddo was home, off and on, it was just the two of us at home for Thanksgiving dinner and we spent a couple days cleaning and doing a little of our Christmas decorating so I didn't go anywhere near the computer, although I occasionally sat down to peruse social media via the phone. We had a pleasant holiday. I prefer big, noisy family gatherings but I have to accept that they're not going to happen, at least for a while. Eldest and Daughter-in-Law have a new baby so traveling was out for them. Maybe someday. We resumed our old tradition of decorating for Christmas immediately after Thanksgiving, which I've missed. I think we've been out-of-town on Thanksgiving for at least 3 or 4 years, now, and I really was happy to return to an old tradition that we've had to set aside. 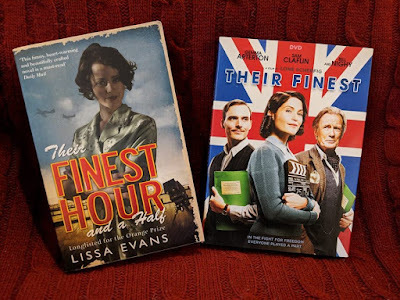 Apart from the usual Hallmark movies (2 or 3 of them, I think), the only movie I watched was Their Finest (DVD at right), which is based on Their Finest Hour and a Half by Lissa Evans -- one of my new favorite authors, as of the past 3 years or so. I have a second-hand copy of the book but haven't gotten to it, yet. The movie was very good and made me eager to read the book. It was not at all what I expected. "That was different," said the spouse. Yes, that's true; it was not told in the Hollywood style at all. The WWII scenes were incredibly vivid and believable (it takes place during the London Blitz), which I always appreciate. Our house came with surround-sound speakers built-in and we usually don't use them because they can be a bit too loud. We turned them on for Their Finest, though, because some of the dialogue was hard to hear. It really made the sound of the bombings intense. We also watched a couple episodes of NCIS. I mentioned I started that from the beginning, right? I've never viewed the early seasons, so I missed McGee's introduction to the team and always wanted to see how he entered the picture. Youngest recently said, "He's an excellent foil to DiNozzo's character." I think that was apparent from his first episode. And, we watched yesterday's episode of Dr. Who. Sheesh, no wonder I only finished one book. But, it was a good week and I've long since surpassed my annual reading goal (I set it at 100 books in 2018) so I'm just not going to worry about quantity, even though this has been absolutely my worst month for quantity in 2018. I'm always telling other people not to fret about how many books they read but just to try to enjoy their reading, so I'm listening to my own advice. Articles of War is one of the books I bought for my Perfect Little Books challenge for 2019 (it's going to be very, very hard keeping my mitts off that one) and Friday Black is a book of short stories that I bought partly because a friend highly recommended it, partly because George Saunders called it "An excitement and a wonder," and also because the timing was right. I recently finished a book of short stories and have been thinking I'd like to read another short story collection. I didn't finish anything at all, last week, because I was going through a post-vacation slump. Fortunately, that finally ended about 2 or 3 days ago and I'm really enjoying my current reads. And, I still have a bookmark in the WWII book but I just read a chapter or two when I'm not in the mood for fiction so that one may be in the "currently reading" column for a few more weeks, even though it's not a long or challenging read. Cupidity and Unsheltered are both great for entirely different reasons. Cupidity is about a young woman who has to support her autistic brother. She and her brother have lived with Uncle E since their parents died. Uncle E makes whirligigs (the cupids are popular) when he's not drinking and spending money on ridiculous schemes. Tammy Louise works several jobs, her main job as a waitress at Two Spoons Cafe, which has the most hilarious requirement that you must accept the soup of the day, no matter how much you don't want it. I really want to try flapjack onion soup. Tammy Louise has fallen for a Nigerian email scam. It'll be interesting to see how that turns out. Unsheltered is about a family that is a bit of a shambles, as is their home. They've experienced all sorts of loss and a serious downgrade in income, so they've moved into an inherited home. There's a second, historical storyline that takes place in the 19th century, when the house was still fairly new. The original owners were forced to vacate the house and decamp to Boston after the father of the household died and they could no longer afford to live in it. But, then the eldest daughter married and they've returned with her new husband. Unfortunately, the house was badly built in the first place. I have no idea where this storyline is headed but they're both engrossing, so far. Usually, I favor one storyline or the other in a contemporary/historical dual storyline book but I don't have a preference, at this point. Barbara Kingsolver's writing just blows me away. So, neither a good reading week or a big posting week. I had trouble sleeping, post-vacation, in addition to the reading slump. 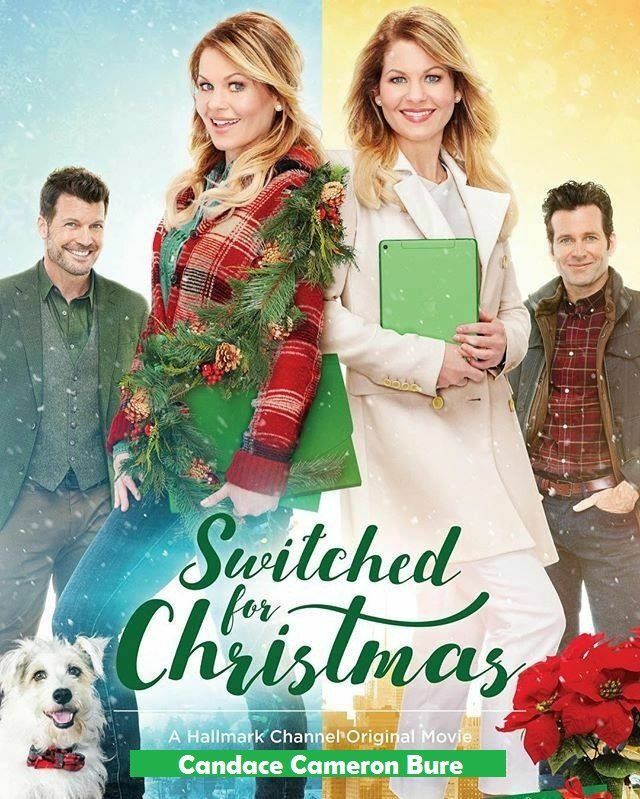 Candace Cameron Bure plays twins who decide to switch places for the holiday season in Switched for Christmas. One is a single mother of two who teaches and is supposed to plan the school's Christmas festival. The other must plan her office Christmas party. I thought Candace Cameron Bure was wonderful in both roles -- surprisingly convincing. Husband watched this one with me and I kept him going by saying things like, "I'm so glad you're enjoying this movie!" during commercials and "Oh, oh, oh, here comes the dark moment," or whatever, during. He's not a fan of light romance, but he stuck around. The next movie we watched was frankly awful (so Husband walked in and out of the room), but it's the only Hallmark movie I've actively disliked and I watched it anyway. I just like the effortless relaxation that comes with watching a simple love story. I've also started watching NCIS from the beginning. I've never seen the first two or three seasons and have always wanted to watch the entire series from the start. Kiddo was streaming an episode and said something about "Kate", whom I've never heard of. He said, "You don't know Kate?" I mentioned that I haven't seen it from the beginning and he went back to the first episode immediately. I've contined watching it without him and got through about 4 episodes, last week. I guess TV replaces evening reading when I'm slumpish. This is my favorite photo of Izzy taken within 24 hours of our return from Hawaii. She was clingy for about 3 days before getting back to normal. 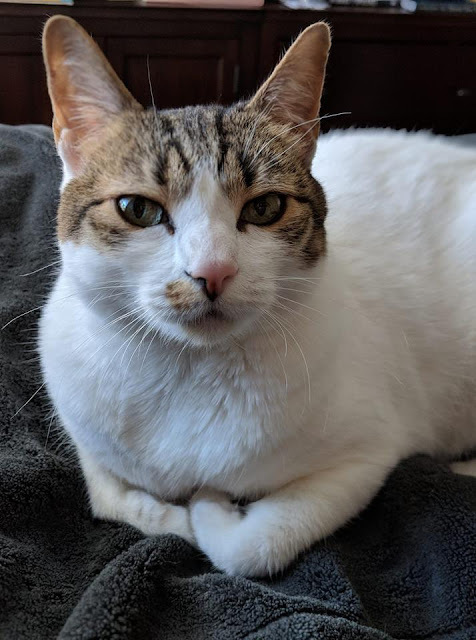 The second day, she started wailing piteously when I was doing housework and the sound was so similar to her hunting cry that I thought maybe she'd caught a lizard and went running to see. Nope, she just wanted me to sit with her. So, I did. And, of course, I took a bunch of photos of her, while I was at it. The Splendor Before the Dark by Margaret George is the second in the Nero series (I have not asked the publicist if the series will continue beyond two books) that began with The Confessions of Young Nero. I received a copy of The Splendor Before the Dark for review from Berkley Books and was hoping that I wouldn't find it problematic that I haven't read the first book. Unfortunately, I did have a little trouble with feeling like I needed a bit more backstory. I stopped just under 20% of the way into the book. The Splendor Before the Dark begins with Nero awakening in his seaside home. Soon, his relaxing time is interrupted by an urgent message: Rome is on fire. Nero hastily dresses and heads to Rome, leaving his wife behind, in safety. When he arrives, Nero finds that the fire has been raging for days and shows no signs of being brought under control. The exciting and fast-paced descriptions of the Great Fire of Rome go on for nearly 50 pages and I found that I absolutely flew through them. It was only after the fire had been put out, Nero was working to house, feed, and clothe his citizens and drawing up a plan to rebuild that I began to realize that I needed to have read that first book because it was then that a diverse range of characters began to enter the picture. The author does a pretty good job of filling you in; I just felt like I needed more. I think the fact that I was exhausted from travel also entered into my decision to abandon the book. I wasn't getting anywhere at all. I'd often read a few pages and find that I was rereading paragraphs over and over, set it aside for a bit, and then come back to find myself struggling again. I've wanted to read a Margaret George book for a long time and I'm glad I dipped my toes into the water, so to speak. While I was finding Nero a little too reasoned and calm for my taste, having read about his insanity all my life, I thought George's writing was excellent. I'll probably read up a little on Nero to see if I've misjudged him before returning to this series. I had no other real issues with it; I just needed to go back to the first book to get to know the characters and time period better. In fact, I learned a good bit. I had no idea, for example, that Ancient Rome had firefighters and found myself spending some time reading up on Roman firefighting. 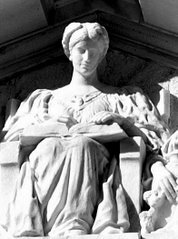 I have The Memoirs of Cleopatra by Margaret George on my historical fiction shelves and I'll probably read that before acquiring or checking out the first Nero book from my library because it's a stand-alone. 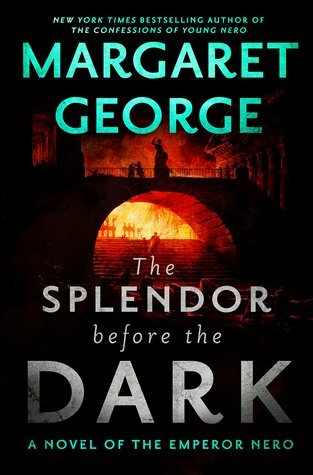 Without having finished The Splendor Before the Dark, I don't feel like I can recommend and I certainly wouldn't advise against reading it. But, I can tell you that what I read was clearly well researched and absolutely engrossing. I just felt like I needed to back up and read the first novel before moving on. I was besotted enough with George's writing to feel like I should put The Memoirs of Cleopatra on next year's list of challenge books. The Splendor Before the Dark is a nice, thick book -- the kind that's great for reading on a cold winter's day in front of a fire. I just recommend reading The Confessions of Nero, first. As often happens when I take a break (but not always -- I would have taken a break anyway, this past couple of weeks, because I was running out of books to write about), I was away on vacation part of the time I've been away from blogging. I'm still recovering, having slept very badly since we returned. Plus, I think the shock of going from the 80s to the 30s (seriously, it's 37° out there, folks!) has given me a very mild cold. 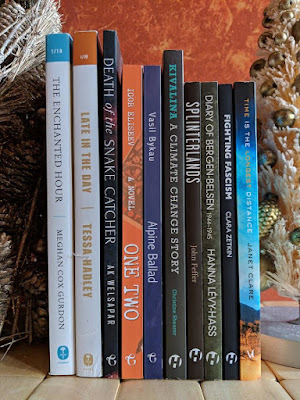 There are some marvelous covers in this batch so I chose to show them off but they'd also make an oddly short stack because most of those purchases are thin books. The Mezzanine and The Wedding of Zein are for next year's challenge to find Perfect Little Books (link leads to a post about some Perfect Little Books I've read in the past). 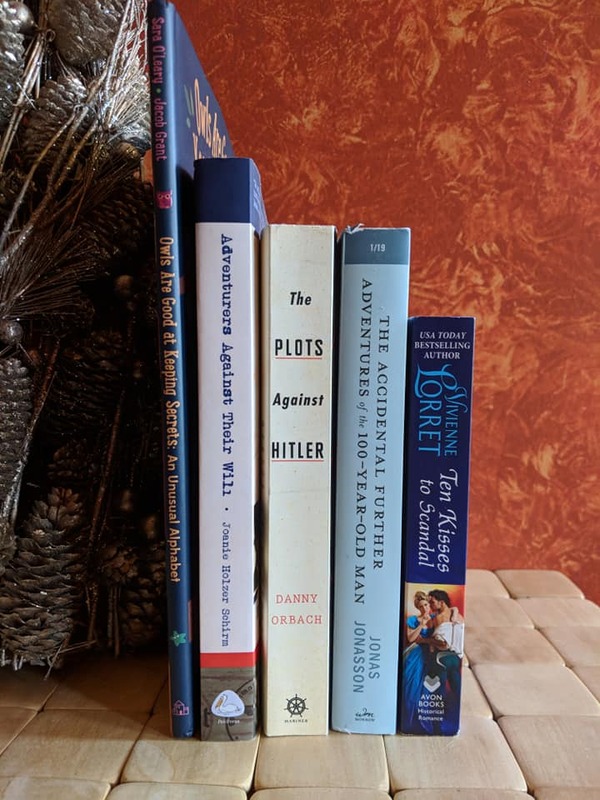 I got recommendations from friends on Facebook and placed an order (at least one more is coming, maybe 2) to get me started in January, since 2019 will be here in no time. I'm open to more suggestions. I want to find books that are around or under 200 pages, paced well, have strongly-written characters and plots with fantastic writing. 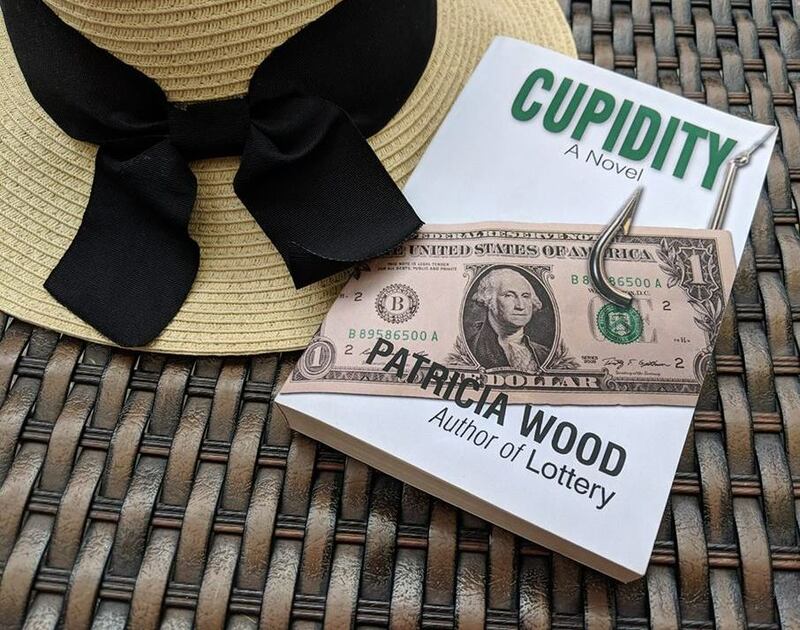 Cupidity by Patricia Wood was handed to me by the author when I asked her if that book, her second published book, was only available electronically. I started reading Cupidity while I was away but then it began to rain and I never did find the time to open it back up. Pat is the author of one of my all-time favorite books since I started my blog, Lottery. I've been to Hawaii and missed Pat by *this much* twice. This time, we were staying near her, again, and I managed to get in touch. She kindly invited us to hang out with her and her husband, introduced me to the Peach-Pear flavor of La Croix sparkling water (I will be haunting the stores till I find some) and we talked and talked. I also was excited to meet her gorgeous kitty, whose name I'm not sure I can spell. He's a sweetheart. I've just abandoned a book so I may go ahead and sneak in a reading of Cupidity. I'd only read 3 pages of Cupidity when the rain began but I was already appreciating Pat's sense of humor. Lolly Willowes was recommended as a perfect fall read by another favorite author, Lissa Evans. I ordered it from Book Depository because I liked what I assume is its British cover -- the American one did nothing for me, but this one has a cat on it. Well, who could pass up a great cat cover? And, The Truth Pixie is by Matt Haig, yet another favorite. I've only loved 2 out of 4 of the children's books I've read by Haig, but he manages to insert surprising bits of wisdom into all of his books, so I felt compelled to give this new children's book a go. I was reading a third book -- the one I mentioned that I would need to return to review on the 15th, before leaving: The Splendor Before the Dark by Margaret George -- but it ended up being a DNF. I'll still write about it on the tour date because I think it's worth mentioning why it didn't work for me but probably will for plenty of other people. Also, it's a tour book so I kind of have to say something, don't I? I'm not generally a fan of beachy locations (I'm a mountain girl) but, wow, that was one relaxing vacation. It was a work trip for Huzzybuns, so I was free to sit on the lanai and read, visit with my author friend, shop, walk in the sand, etc. I loved the freedom to just spend the day doing whatever I felt like. I finished Marilla of Green Gables on a day that I just felt like reading. Part of my reading time was spent by the pool and part on the lanai and I did some sink laundry when I needed to take breaks. The seafood in Hawaii is amazing, too, so I had fun eating out. I've just watched two more Hallmark Channel movies and I'm finding it surprising how much they reuse the same actors. I found myself comparing how convincing they were in their opposing roles, today, as 3 out of 4 of the love interests were repeat actors. I liked all 3 better in their first roles, which may mean it's just hard for me to switch gears. I found myself thinking, "He's a wealthy man with warm memories he's revisiting, not a small-town innkeeper!" Having said that, I liked 2 of the actors in their new roles, once I managed to turn off thoughts of their old parts. 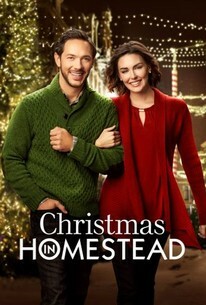 Christmas in Homestead is about an actress and a mayor/innkeeper who fall for each other, similar to a Notting Hill type of storyline but without the quirky ensemble cast. Jessica is filming a Christmas story in Homestead, Iowa. She's recently broken up with her actor boyfriend and is planning to go to Fiji with a friend of hers for Christmas, since her presence at home is such a disruption (paparazzi follows her around). Her former boyfriend just happens to be playing her love interest in the movie she's filming. Matt is the mayor of Homestead, a widower with a 10-year-old daughter who is a fan of Jessica's fantasy/action films. The two stars and the director are staying at the inn Matt and his sister inherited when their parents retired. He's never seen Jessica's films and isn't star-struck at all, but as they get to know each other, an attraction grows between them. Can they make the actor/small-town-guy relationship work? Or will her former boyfriend convince her to return to him? There's almost a secondary romance but not quite. It's more of a male/female friendship but it's cute. The actor who plays Matt was also William Darcy in Christmas at Pemberley, which I loved, but I think I'd like him in any role. Jessica played an artist in The Art of Us. She's gorgeous enough to play an actress who must convince us she's a star who is followed around by photographers, but I liked the storyline of the other movie a bit better, although pieces of it made little question marks float over my head. 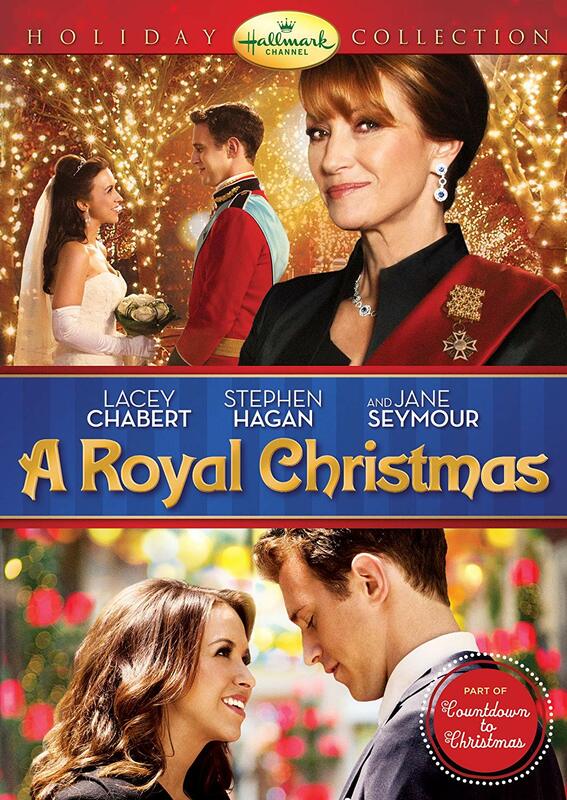 A Royal Christmas came on because I didn't switch off the Hallmark Channel fast enough and who am I to fight fate? I decided to go ahead and watch it. Emily is a seamstress who has been dating Leo for a year. Leo is planning on spending Christmas with her family, but then he's called home and is forced to confess that he's the prince of a small nation near the South of France. He invites Emily to go with him. Jane Seymour plays Queen Isadora, a prim and proper monarch who expects her son to marry a duchess named Natasha, who both has the proper background and has known him from childhood. The queen is dismayed at the casual manners of the American girl Leopold has brought home with him. 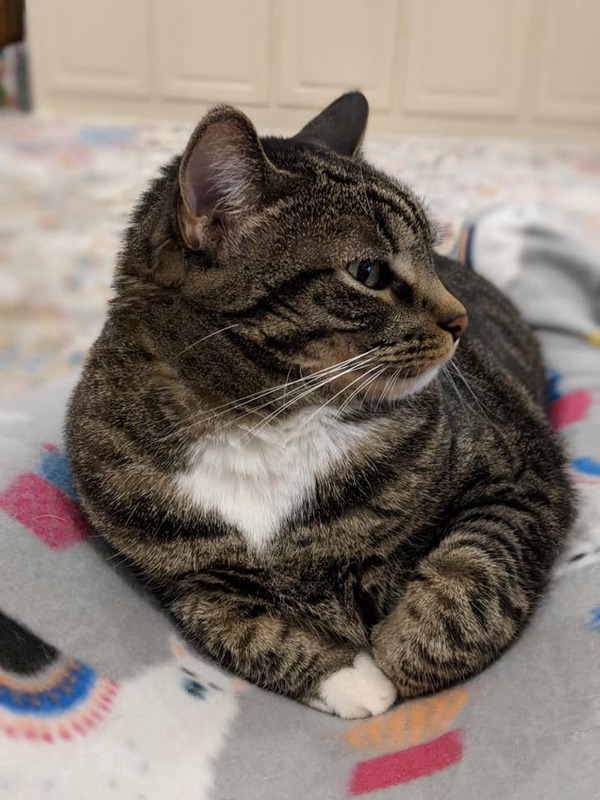 Emily knows nothing about dinner etiquette, is a lowly commoner, and she likes to hang out with the downstairs help. Can she dissuade Leo from his plans to propose and get him back together with Natasha? A Royal Christmas is predictable in every way, which is fine. I didn't care and I had to reach for the tissues, in the end. I thought Lacey Chabert was much more convincing in her other role (one of those innkeeper/busy businesswoman pairings) in which I saw her, but the prince was a bit Prince William-like in his features and I found him very believable. Jane Seymour was fun as the bitter queen. I am so loving this new channel. It's like comfort food . . . incredibly relaxing to watch gentle romance movies. Before I get into the synopsis of The Last Ballad, I have to tell you the coolest thing about reading this book. I read Wiley Cash's last book, This Dark Road to Mercy, and was impressed. So I drove up to Oxford, Mississippi to see Wiley speak at Square Books when he came through on his book tour. 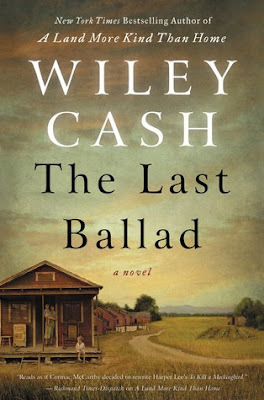 At the time, Wiley had recently read about the events that The Last Ballad is based upon and was already beginning to plot his next novel. He talked about the historical background a bit and said he was excited about his next project. It's been several years so it was a thrill to finally get to read the book that was, at that time, still mostly an idea in his head. Incidentally, if you ever get a chance to see Wiley speak, you must. He's an excellent speaker. The Last Ballad is the story of the early labor movement, with focus on a woman who was murdered in the 1920s. Ella May Wiggins is a single mother with four young children. Her husband, John, has run off, leaving her to support them on her job at the local mill, where she earns nine dollars a week. 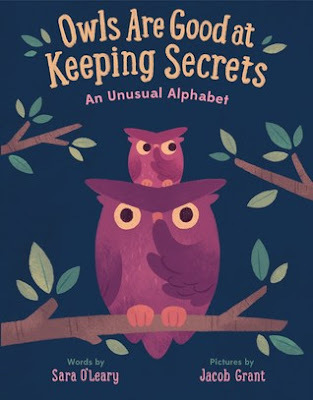 Most of the time, the children are left at home alone during her night shift but, as the book opens, Ella May is being called in to talk to the boss because she missed a shift to take care of a sick child. She has already lost one child to illness and her unwillingness to risk the life of another has threatened her job. Shortly after she's chastised for missing work, Ella May hears about the fancy New Yorkers who have come to town to help create a labor union. Ella May's children wear tattered clothing and the entire family is skinny and starving, most of the time. She's encouraged by the idea of a union improving their lives and goes to a meeting to see what it's all about. And, then another. In spite of the violent attempts to stop the union, Ella May is undeterred. She writes her own lyrics about the hardship of a mill worker and is persuaded to sing at a gathering. From then on, she's well-known and it's only through finagling a job working for the union organizers that she's able to continue getting an income. But, being involved is dangerous work. Highly recommended - Gorgeous prose, a story that really gets into the depths to which employers will go to increase the bottom line at the expense of their employees and makes you practically feel the hunger of Ella May and her family. Sad, moving, and meaningful. Just a fantastic story that will leave you in awe of the main character's courage and tenacity. There were times I felt a tiny bit bored and wondered if The Last Ballad couldn't have been edited down a bit, yet the writing is so beautiful that it would be awful to remove a word from it. I'm so impressed with Wiley Cash's writing. I still have Wiley's first book, unread. Now I'm doubly looking forward to it. Hey, Kiddo: How I Lost My Mother, Found My Father, and Dealt with Family Addiction by Jarrett J. Krosoczka is a graphic memoir about the author and illustrator's life. The book begins by telling about Krosoczka's mother and her family, how his mother became pregnant and was rejected by the father of her child and how baby Jarrett ended up spending most of his time living with his grandparents while his mother flitted in and out of his life, writing to him but seldom showing up. Krosoczka's life was interesting for the colorful language of his grandparents, his mother's method of encouraging his art from afar, and how he handled the challenges of not knowing who his father was and what his mother was up to. Eventually, he learned the truth: his mother was an addict who came and went from home to the street to jail or halfway houses. 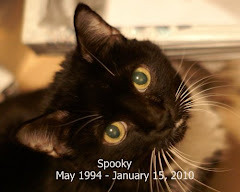 Because she occasionally wrote to him and showed up when she was able, Krosoczka knew his mother loved him but he always missed having her in his life when she was away. Highly recommended - I don't feel like I'm doing an adequate job of describing Hey, Kiddo, so I'll just skip to the bottom line. 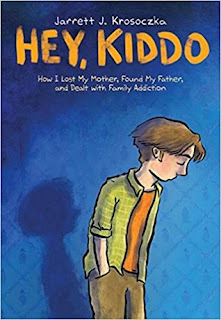 This is a highly readable graphic novel that gives you a distinct sense of what it's like to grow up not really knowing either parent and how erratic the life of an addict is. It also tells about the author's artistic journey, how his talented mother and his caring grandparents encouraged his art, and what he learned from art instructors that influenced him, as well as his stylistic choices. It's a touching, deeply meaningful story about coming through an unusual and sometimes difficult childhood and the destructiveness of addiction to the addict and everyone around her. I found this was one of the clearest graphic novels I've ever read. Usually, authors rely a little too heavily on the artwork to do the explaining but there's plenty of text and I didn't find the art confusing as I often do. 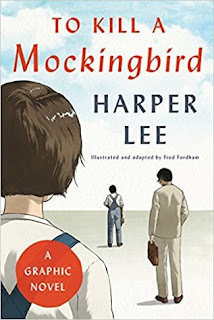 To Kill a Mockingbird by Harper Lee, illustrated and adapted by Fred Fordham is a graphic adaptation of the classic novel by Harper Lee. You can tell what you're getting into by the prominence of Harper Lee's name on the cover and the words "illustrated and adapted". Sure enough, Fred Fordham -- the illustrator who adapted the novel -- almost exclusively used words directly pulled from the novel. He only altered them when necessary for clarity (I couldn't tell when that occurred: I just know it because the author said so). I've only read To Kill a Mockingbird once, but it's one of those books that sticks with you because it's so brilliant and meaningful. Still, there were times I didn't understand what was going on in a particular frame or set of frames. But, in general, when I couldn't figure out what was happening it was quickly clarified, so a handful of frames that perplexed me was never enough to cause a problem. Also, the farther you get into this particular graphic novel, the better it becomes. Highly recommended - An excellent adaptation of a classic novel into graphic novel form. The characters are clearly identifiable and there were only a few instances in which I couldn't tell exactly what was happening but the confusion didn't last long. I particularly appreciated the use of Harper Lee's actual wording. I didn't know it was hers till the author's note but I presumed so because of the language, which is pretty distinctive and a little old-fashioned. Hey, Kiddo has a particular colored palatte that was a deliberate choice and a little unusual -- not full color but limited to about 4 colors. The finished copy of To Kill a Mockingbird appears to be full color. I have an ARC that's black and white but I looked online and found a video at Amazon of the author and he talks about using watercolor washes and shows himself coloring in some of the images. It looks beautiful and I think maybe the final, colored version will make some of those frames that I had trouble with make sense. In at least one case, there was a series of frames that were so dark that they were almost entirely black. Colored, I would imagine the characters stand out better, even though the reason they were dark was because they took place at night. At any rate, the graphic novelization of To Kill a Mockingbird would probably make a super gift for those who claim it as their favorite book. In my case, it made sense of at least one scene that I had trouble understanding when I read the book, years ago, so it's also great for anyone who loves the language but may have been slightly baffled by a scene or two. 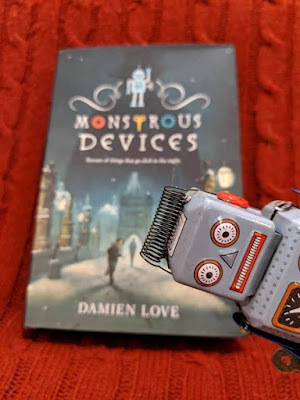 In Monstrous Devices by Damien Love, when Alex's grandfather sends him a robot, Alex is not surprised. He's been collecting robots for years. But, this one is different -- older, unique, even a bit creepy. And, it has a secret. Alex's grandfather shows up in England shortly after Alex receives both the robot and an unexpected visit from two dangerous little robots that attack Alex. He'll have to miss a bit of the school term but it's almost over and Grandfather's in a hurry. So Alex quickly goes along with his Grandfather's scheme and they take the Chunnel train to Paris. There, they hope to stop a very bad man and his entourage, who use deadly robots to get what they want. As they travel, Grandad tells Alex stories, things that are are connected to the robot's secret, and bits of history that relate in some way. He tells him about the first robot ever made, in Prague, and the story of a missing robot, one of a set of three. From England to Paris to Prague, Alex and his grandfather chase down clues, run and dodge dangerous flying robots, a man who can jump long distances, and two beefy bald men, as well as a little girl who has control of a large number of fliers (flying robots) with sharp edges and hooks. All are after the robot Grandad sent to Alex because only that robot can help them acquire something dangerous in the name of power. 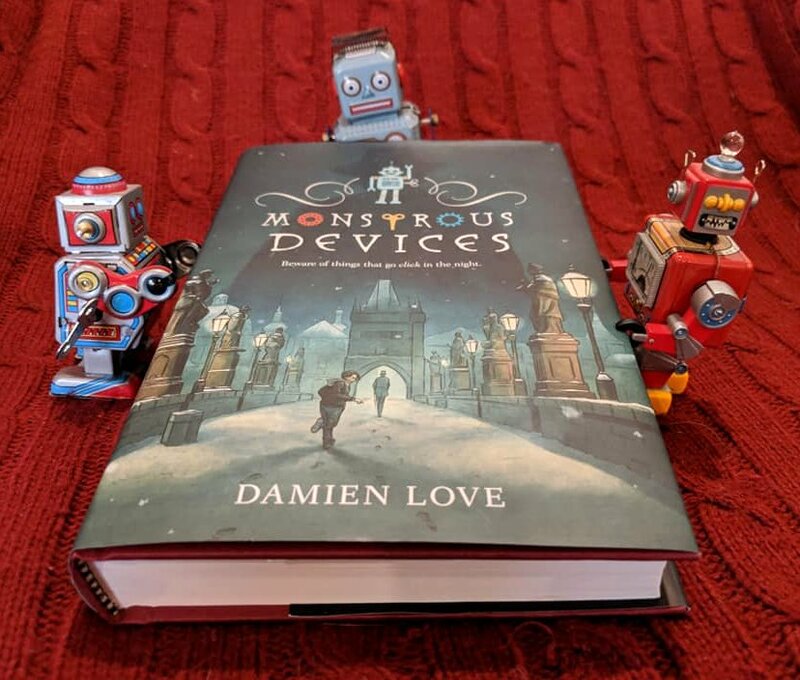 Highly recommended - Monstrous Devices is an adventurous, riveting middle reader with so much action that I occasionally yearned for the slower chapters that served to allow this reader to catch her breath. It's exciting. Alex is bullied at the beginning of the book but by the afterword, he has come into his own. I enjoyed Alex's character arc and the lighthearted grandfather who always does something and then tells Alex, "You should never do this. Very unhealthy. Could get you killed." Grandfather made me smile. A nice blend of action, adventure, and humor. Below the title it says, "Beware of things that go click in the night," in case you can't read the tiny print.